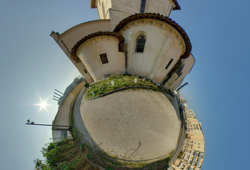 Home » Posts tagged "Wee Planets"
Thanks to The Telegraph, I just discovered Wee Planets by Alexandre Duret-Lutz. They are remarkable. From his Flickr photostream: Vieille église de Mérignac, originally uploaded by gadl.